Lid and casserole with no damage. It holds approximately 40 ounces. 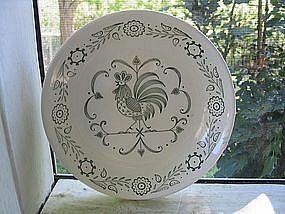 I have several plates and large teapot available in this pattern. I need your zip code to calculate the postage. 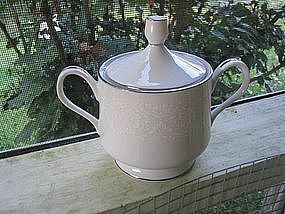 Grace Fine China manufactured in Japan. There is no damage to this creamer. I need your zip code to calculate the postage. Marked as Grace Fine China Japan and Concerto. 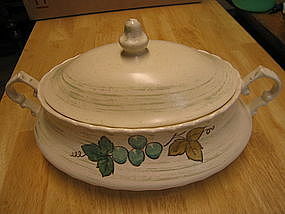 This listing includes the bowl and lid. Little to no sign of use. Additional condition photos by email. 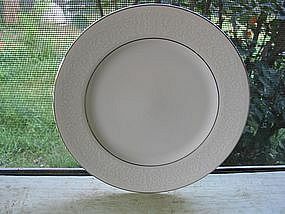 I have the matching creamer, dinner plates, bread plates, cups and saucers available and are priced individually. I need your zip code to calculate the postage. 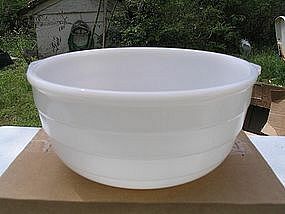 Four (4) quart milk glass bowl for table top electric mixer. Tab handles but no pour spout. There are no chips, cracks, breaks or rough rims. There is minimal usage marks to interior and exterior. Additional photos or info by email. I need your zip code to calculate the postage. 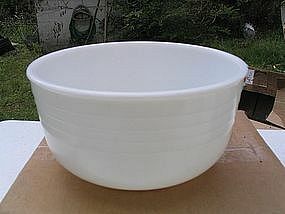 Manufactured by Glasbake and identified as 15 milk glass mixer bowl. It was produced in the USA for the GE stand mixer. 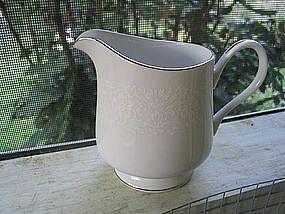 It is the 4 quart size with tab handles and pour spout. No chips, cracks, breaks or rough rims. Slight usage wear. Additional photos or info by email. I need your zip code to calculate the postage. 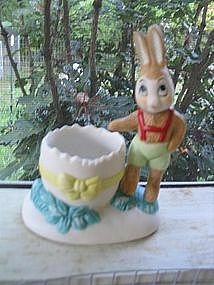 I've never known what this bunny holder was supposed to be, but just put them out at Easter with a dyed egg with artificial grass. I noticed someone last year calling them egg cups, and they might be, but I don't know if the material would be safe for food. It measures approximately 6 1/2 x 4 inches. No damage. 2 are available and priced individually. Marked as Anchor Hocking Hallmark 1986. 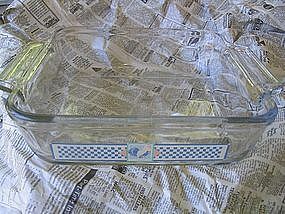 It is a 2 quart baking dish. No structural damage but has been used. Additional photos or info by email. I need your zip code to calculate the postage. 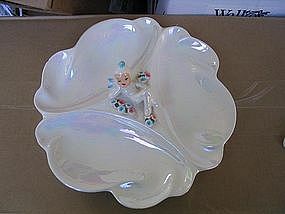 Snack tray or dish by Lefton. Red Lefton label from Japan and numbered 697. It measures a bit over 9 inches. There are no cracks or breaks, but there are a few paint chips around the rim, as well as one small chip that is deeper than a paint chip. If you will note in the photograph on the left rim, you will see the chip. Additional photos by email. I need your zip code to calculate the postage. 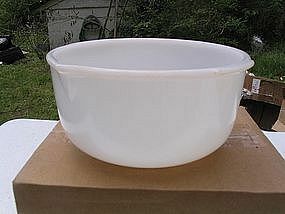 Soup bowl size measuring 7 5/8 inches. It has several manufacturing flaws, but no chips, cracks, breaks, rough rims or finish loss. Several other pieces in this pattern are available. I need your zip code to calculate the postage. 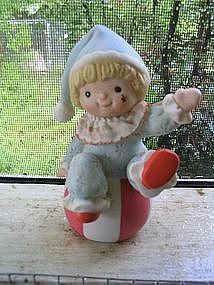 I have no idea of the manufacturer of this piece. 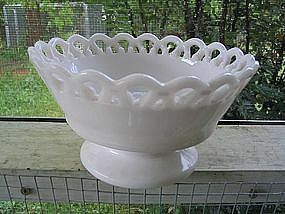 It is a dense milk glass and weighs around 1 3/4 pounds. It is 6 3/4" across the top and 4 inches in height. No damage but has a rough mold line. Additional photos or info by email. I need your zip code to calculate the postage. 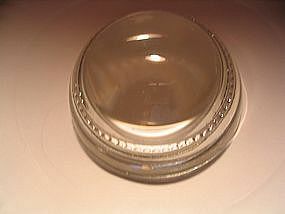 Paperweight magnifying glass measuring 3 1/4 inches. I am not sure of the age - I've only had it a few years (not new when purchased). There are no chips, rough rims cracks. 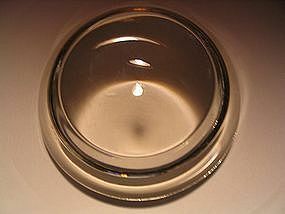 i've been collecting magnifying paperweights for years and have 3 for sale. 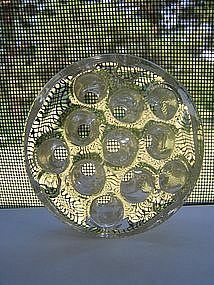 Vintage glass flower frog with 11 holes. It is 1 1/2 inches in height and 3 1/8 inches in width. No chips, cracks or breaks. I have 2 in this style available and priced individually. I need your zip code to calculate the postage. 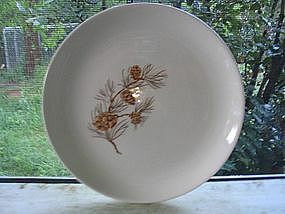 Seven inch salad plate manufactured by Taylor Smith Taylor for Sears. Very little sign of use. 3 are available as well as cup/saucer sets and are priced individually. I need your zip code to calculate the postage. Approximately 5 inches in height. Some manufacturing flaws and the cloth collar hem needs re-stitching in one area. Additional photos by email. I need your zip code to calculate the postage.